These are the top-rated and most talked about air mattress for camping. Once you have looked through the list, be sure to check out the how to buy section for tips about choosing which of these mattresses is right for you! The Dream Series from SoundAsleep has received a lot of praise. Though the mattress looks and feels like the same mattress you have at home, it has been designed to handle the rigors of camping. There are 40 air coils to help support your rest, so even those with aches and pains can sleep easily. You also don’t have to wait for hours for the mattress to inflate or deflate, thanks to the one click internal pump. In fact, the pump works so well, it fills in as little as 4 minutes. Despite all the features, the SoundAsleep also has a modest price tag that is the perfect balance for most camping families. For those seeking something a little less high and bulky should consider the single level airbed by Etekcity. The airbed has been designed for outdoor use and folds up swiftly for easy transport to and from the campsite. Set up is quick and convenient, thanks to the portable, rechargeable electric pump that is compatible with all AC/DC outlets. Plus, the Etekcity Camping Mattress will inflate in about a minute. On top of that, the mattress is designed to keep it airtight and supportive throughout the night. No bulges or uneven surfaces! There has been reports of the pump not holding a charge longer than 1-3 days. While on first glance the ALPS Mountaineering Velocity Air Bed looks like a thin mattress that only the most die hard camper would choose, you will be surprised by the comfort and quality offered by this mattress. The unique polyester Oxford fabric and internal coils make the mattress durable, solid, and highly supportive. Also included in the mattress is a rechargeable pump that can be charged via AC/DC outlets. Simply flip a switch, and the ALPS Mountaineering air bed will inflate or deflate within seconds. Since the mattress is extremely lightweight (about 5 pounds) and fits into an included stuff sack, it is perfect for toting along for more long distance treks. The turn dial system for inflation/deflation can be easily bumped into and moved, meaning you could accidentally release air from the bed. Probably the greatest benefit of the Intex Comfort Plush Elevated Dura-Beam Airbed would be the very fact that it is raised and indented. This means you can use sheets with this mattress. Silk sheets in the middle of nowhere? Heaven. Jokes aside, the Intex airbed also features a powerful electric pump that fills the queen size mattress in 4.5 minutes. The top of the bed is waterproof, and the Fiber-tech construction makes it very durable. If you aren’t looking to spend a ton of money on a mattress, the Intex Comfort Plush is a great option for those with children, because it has a low cost and impressive features while being big enough for everyone to enjoy. The name Coleman is well-known and trusted in the camping world, but to see Coleman on an air mattress might be surprising to some. Without a doubt, Coleman has balanced cost with quality with this mattress. There are two sizing options, Queen and Twin, and one option even allows you to choose a pump (otherwise you need your own). A benefit of the Coleman airbed is the “airtight system,” which ensures seams don’t separate. The plush surface boasts comfort, while the underside of the bed was made with PVC and is durable enough to last for many years. The Stansport Self-Inflating Mattress is an excellent choice for campers who want to be able to pick up and move in a hurry. Since the mattress is self-inflating, you can go on long treks without having to worry where your electricity is coming from or packing extra batteries. The mattress is available in three different sizes, but each is extremely lightweight and portable. You also receive a compact mummy bag for quick storage. Since it is constructed from fully bonded materials, the Stansport model is waterproof, durable, and provides top-notch insulation against cold earth. Here are some buying tips for selecting the best camping air mattress that suits your needs and outdoor style. There are two ways to classify an air mattress: heavy or light. The division is based on the materials used in the construction of the camping air mattress. If comfort happens to be high on your list, or if you have an injury or chronic pain of some sort, a heavier bed is going to serve you best. A small tent isn’t going to fit a queen size airbed. Therefore, you need to consider the size of your tent and compare the floor space to how long and wide the mattress is. If you want room to walk around the bed and store some supplies, you might have to go smaller with your mattress…or get a bigger tent. Also, another thing to keep in mind is that most airbeds aren’t meant to be put directly on the ground but for inside a tent. If you plan on camping in colder weather, the tent floor might not be enough to separate the air mattress from the cold, so use a sleeping bag too. First thing, you have two main options: hand pump versus electric pump. There is also self-inflating, but let’s forget that for now. An electric pump mattress is great when you plan on camping in a park or near your car, because a bulky electric pump is cumbersome. While some mattress come with the electric pump built-in to the materials (and most likely require 4D batteries), you can sometimes also purchase a portable pump separately. A DC electric pump will draw power from the 12V outlet on your vehicle while an AC electric pump will need a generator or wall outlet. There are camping beds designed for every budget, whether your are the minimalist or the glamping pro. What you need to be aware of is how cost affects convenience and comfort. A lower cost mattress will generally be thin and less durable. Meanwhile, a high-end camping air mattress will be heavier, most likely have an air pump attached, and be extremely durable. 1) Never over-inflate an air mattress. Though you might want more firmness, over-inflation can lead to premature rips and leaks. 2) Use the mattress once before camping on it. Why? Because the plastic needs to get stretched to capacity at least once in order to make the mattress more comfortable. 3) If you find a leak, patches or adhesive strips may be available (often directly from the company) to repair the leak. 4)​ Avoid wrestling on the mattress or overloading it in anyway. Though weight capacities can be as high as 600 pounds, that can easily be topped when you have several people using the mattress as a place to sit. Camping might require a certain amount of grit and determination, but you shouldn’t have to deal with long periods of discomfort and sleep deprivation. After all, if camping is an adventure, then you want the best memories and dreams as possible. 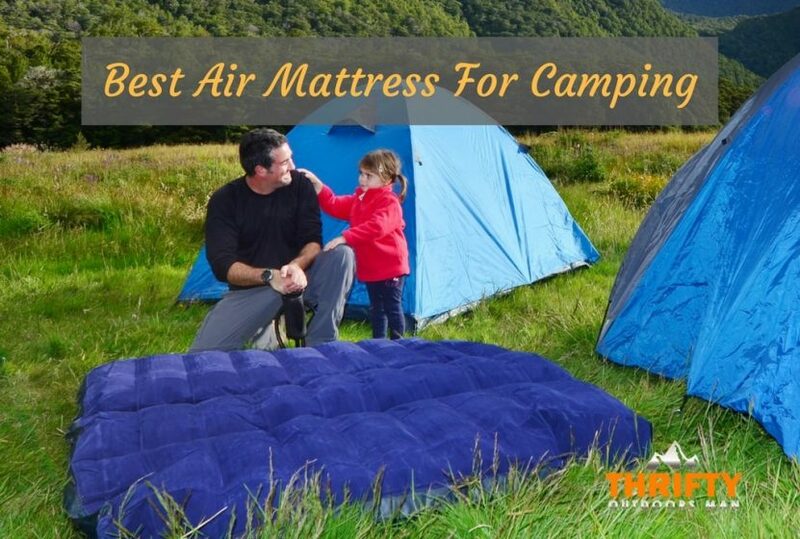 Choosing the best camping air mattress for you is based on your needs, but with so many different comfort levels, designs, and brands out there, you might get confused. So use our list of top air mattresses for camping to help you decide!